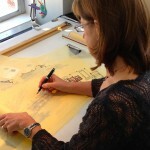 Much of the practice of architecture has moved from the drawing board to the computer screen as technological tools replace pencils and tracing paper. However, sketching is an integral part of my work process. Drawing serves two critical purposes in architecture. First, it is an essential part of the design process. Through sketches, I can evaluate an idea, a form, a shape. I can bring them together and see what works, what must be moved, what is beautiful, what is functional and what is both. In my office these are called “Laura Lines,” my process of evaluating and evolving a design on paper. As I sketch, my idea becomes more refined, as do my drawings, from a vague feeling to a refined concept, until I have something a client or colleague can understand. 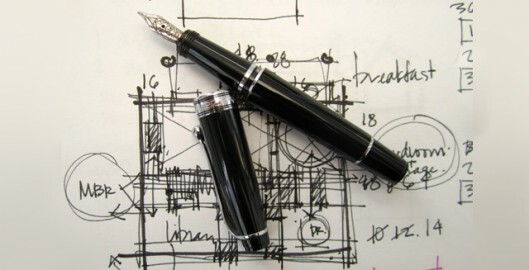 In addition to its role in the design process, drawing is the language with which an architect speaks. I can talk to you about your home, but nothing can replace what I can show you. What may look like a quick sketch is actually very thoughtful. As quick thumbnail sketches transform into architectural drawings, our conversation becomes richer and more complex. A project can come to life on paper in a way it simply can’t in normal conversation. We use technology at Melville Thomas Architects every day with computer drafting and modeling programs. But I believe in the value of connecting the architect with the design on the page in a way that can’t be replicated solely through a computer. Drawing by hand is a part of who I am. I sketch daily in the office for my projects and practice my observation and drawing skills while traveling through my watercolors . Kudos to Michael Graves (1934-1915) for having stood up and declaring that drawing is as relevant in today’s technology-driven world – perhaps even more so – as it was when architecture first began. So true. Thank you. I’ll get my sketchbook out. As an architecture professor said, “Drawing is where all the answers are”. Visual people need to connect brain-to arm-to hand-to paper. Sketch-up, and pay very little attention to this” “soon to be lost” art of freehand drawing. I pride myself with freehand drawing, sketching out details before “burning” them in.